I started in 1998 with a used C8 on a Vixen GP, controlled by a Skysensor 3D. For imaging the wooden tripod was replaced by a self-build tripod made of steel square pipes. This improved significantly the stability of the mount. 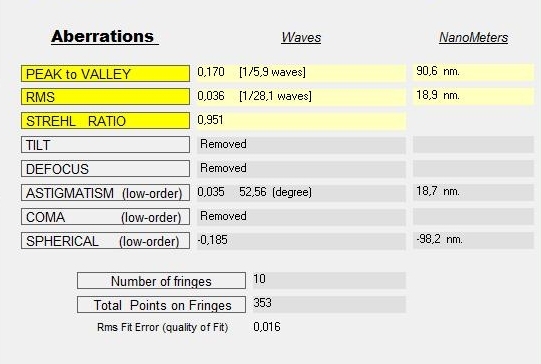 I spent many hours on minimizing the backlash of the worm gear but never could force it below +/- 50 arcsec. Of course, this high backlash resulted in some problems with the pointing accuracy and tracking precision. Nevertheless, with patience and practice the equipment was o.k. for the beginning. The next improvement was the application of the gear-part of a potentiometer to the focusing knob. This really simplified the reproducibility of focusing using a Schreiner-mask (cardboard with 3 holes) or artificial diffraction spikes. Of course , a dew cap made of camping mat was added and the tube was thermally optimized by applying insulating foil. Using a Celestron F6.3 and a variable Meade F3.3 focal reducer resulted in a high flexibility concerning the available field of views. 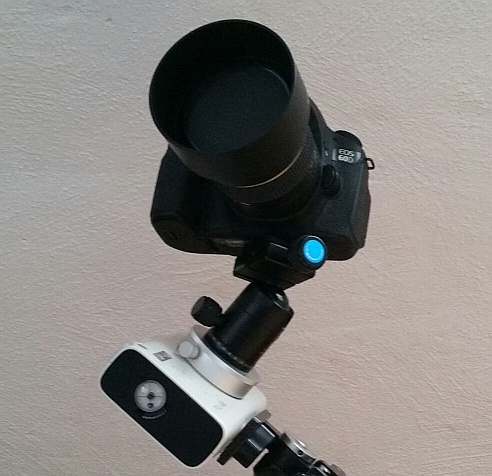 In the mean time, the mount, tripods and the Skysensor are sold. It took a while to sell also the C8 as the optics were quite good (see the image of NGC6543). In 2002 I bought the Parks 10" /F3.5 Newton from Gido Weselowski. Gido discovered the galaxies "Weselowski I+II using this scope. Before Gido, Rainer Mannoff owned this rare scope and showed the extraordinary capabilities of the Newton in capturing wide field images. The focal length of 890 mm (F/3.5) fits very well to the pixel size of the Starlight cameras. If a higher magnification / longer focal length is needed this can easily be realized by the Vixen tele-extender (results in F/7). Despite the fast F/3.5 the field of view used by the chip of the MX7 shows no significant coma, a corrector can be omitted. 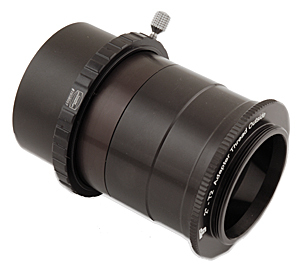 For the larger chip of the SXV-H9 a Baader-coma corrector is used in case of working at F/3.5. The glass fiber tube shows a very low thermal expansion. Thus, also imaging sessions lasting the whole night can be run without the need of re-focusing due to changing temperatures. Of course with the very fast focal ratio of F/3.5 comes the need of collimating the scope after each setup. The Newton puts 20 kg (44 pound) on the scale. Together with 15 kg counter weights and the imaging equipment more than 40 kg sit on the Gemini mount - but this seems to be no problem for the mount and the motors. Compared to the Vixen GP, working the first time with the Gemini mount was a real light bulb moment: Due to the high positioning accuracy the objects every time were on the chip at the first attempt. I measured the periodic error to be +/- 5 arcsec which is well within the specification. The FS2 runs well and no problems occurred in controlling the scope via Skymap and AstroArt. The only draw back I found, has been the periodic error correction function not working for the Gemini mount. This PEC would allow to further minimize the tracking errors although off axis guiding is involved. In 2003 I bought a C5 with a Nexstar-mont from Peter Bresseler. This scope is mainly used for traveling abroad. The optical test showed a quite good performance. 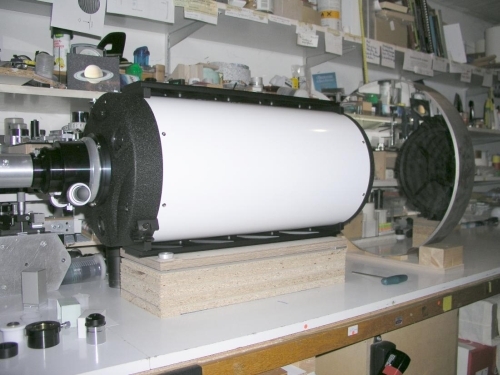 In September 2004 I decided to acquire a Wiliam APO 80/480 with TMB-optics for wide field imaging. The first light was deflating: star images were totally distorted. After 3 month of testing the scope was sent back to the dealer Markus Ludes and replaced by a new one. The new scope is fun: imaging is straight forward with crisp images and pure colors. Visually, the scope outperforms the C5 concerning contrast and sharpness. 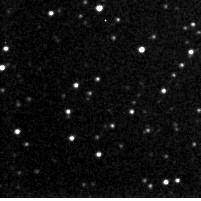 The first attempt to create a mosaic using the SXV with the 80mm William and the first image gained with the larger chip of the ALCCD6 (QHY8) showed that in those cases the use of a flattener is mandatory. Thus, I bought the TS-Flattener and the results are very convincing, see beneath. In spring of 2005 I bought the Takahashi CN-212 from Helwig Fülling. This scope has a unique concept: By changing the secondary mirror the scope is changed from a F/12.4 Cassegrain with to a F/3.9 Newton. 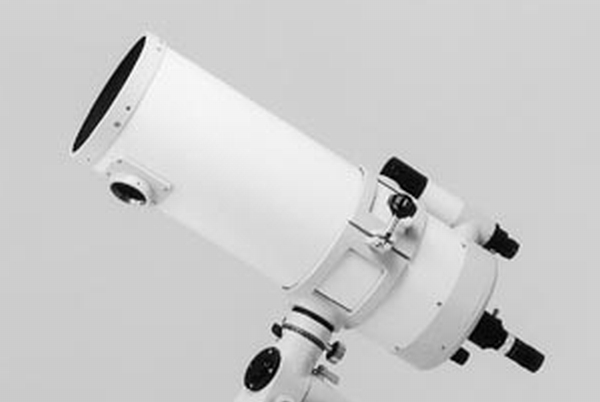 This scope is intended to substitute both the 10"Parks and the C8. First I tested the Cassegrain focus with good results. Despite the slow F-ratio / long focal length (2620 mm) and the mediocre average seeing conditions of my observation location I successfully imaged small and faint deep sky objects. The collimation of the Newton focus took quite a good time and a lot of trial and error experiments. Nevertheless, at least I managed a proper collimation and my expectations of image quality were fulfilled. But it has to be pointed out that collimation of the CN-212 in Newton configuration is quite more complicated compared to the Parks Newton and deviations from the optimum result in drastic coma effects. On the other hand, once a proper collimation has been reached it is significantly more stable compared to the Parks. In spring 2011 I bought the new RC from Wolfi Ransburg. First it was tested and collimated by Wolfgang Rohr. 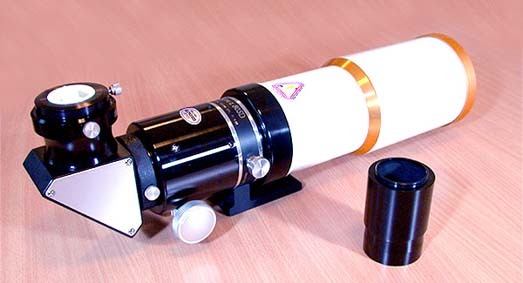 He stated the superb quality of this telescope: "Up to a field diameter of 21 mm the very sensitive Artificial Sky Test showed clearly defined points at a magnification of 1000x. This proofs the resolution of 0.55" arcsec up to 21 mm field diamter." GSO Ritchey-Chrétien 10"F8 at the optical bench of Wolfgang Rohr. In early 2014 I odered an additional somewhat bigger APO form TS. The APO is equipped with a 2,5" Flattner and an additional 0.79x reducer. 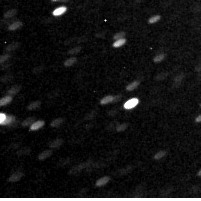 The check of the Apo at the oprical bench of Wolfgang Rohr shows that I again had good luck: Wolfgangs comment: "An impressing APO with a super flat image field". 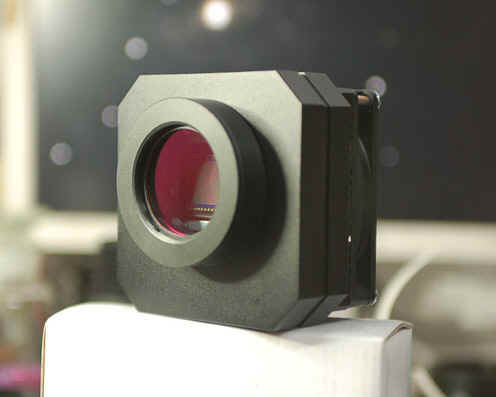 My first CCD camera was the Starlight Xpress MX5c. I wanted to do color imaging and therefore the MX5c promised to be the straight forward way. For beginning purpuses the camera was o.k. but soon I claimed for more than the MX5c could deliver. In particular, the small dynamic range of 12 bit showed to be not sufficient to deliver high quality images of faint deep sky objects. As I very liked the self-guiding option of the camera and the economic setup for color imaging I upgraded after two years to the MX7c. Within 2 years a lot of images with increasing quality were gathered. With increasing imaging skills the read out noise of the MX7c and the sometimes unsatisfying color synthesis procedure hindered me from advancing in image quality. Therefore, in 2004 I decided to go on with a b/w SXV-H9 and a filter wheel from Naumann. Thus, I had to learn that a separate guiding scope does not deliver the needed tracing accuracy and a less comfortable off-axis guiding is needed. Well - the comfort of The MX7c was gone but the image quality won. My first trials to catch large objects by creating mosaics were not too successful. Therefore I looked for a CCD camera with a larger chip. Due to cost and to not run into compromises operating an non cooled camera like the EOS I decided to get an ALCCD6 (=QHY8). 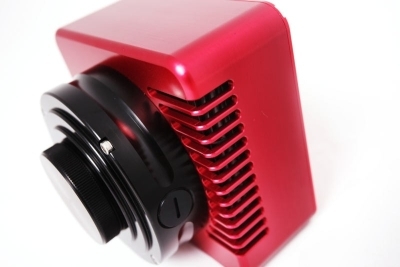 This is a 6 Mbit camera with an APS-sized chip. First light showed nice results. Yes, noise is higher and QE lower compared to the SXVH9 but there are no problems with color synthesis and amplifier glow as obtained with the MX7c. Taking pictures without dark frames and flat fields works good, the sensitivity for Ha is o.k. The ASTROART plug in works without problems. Nevertheless, I was not able to figure out a reliable procedure for constantly satisfying results. Especially homogeneous saturation levels of the RGB channels were the problem. Thus I decided to sell the ALCCD and to go back to a b/w camera with a larger Chip than the SXV (Atik 383L+). 2) because of the well established KAF8300 Chip. Following the advice of my dealer, Wolfi Ransburg, I ordered the smaller ATIK 383 and not the ATIK 4000 with the larger squared chip. This reduced the effort for avoiding vignetting due to filters, autoguiders and so on. Nevertheless, the 80 mm secondary mirror of my Parks 10" Newton had to be replaced by a 104 mm mirror. The first trials in wide field photography using a Fuji X10 were not successful. After switching to a Canon EOS 700D wide field images under the dark skies of the south-west of USA became easy. So the next step was to use the Vixen Polarie for tracking and a EOS 60Da for enhanced red sensitivity. Together with the, compared to the 18-200 Sigma zoom lens, superb Samyang lenses 14mm F2.8 and 85mm F1.4 the first pleasing images of the milky way were possible. All my images were taken from the balcony of our 250 year old timbered house in Nimburg, which is a small village 15km north of Freiburg in the south west part of Germany (Black Forrest). Stand and mount are fixed on the balcony whereas the telescopes are set up extra for each imaging session. The location is very far from ideal: Light pollution due to neighbors and street lights is substantial and only a slot of sky is available for imaging. Additionally seeing is limited due to the direction imaging points above roofs with the effect of thermal turbulences.